Oddly, having spent most of December away on holidays, it hasn’t quite sunk in that Christmas is a couple of days away; I keep thinking it’s early December. I suspect this means that the next week is going to hurt lots. Then again, this is a bad time of year for me anyway and christmas seems to lack joy these days. Only to be followed by NYE and the memory of a lost mate. Nearly a year after that fateful day, another friend was lost and I gave up canyoning altogether. Actually the reality was that I stopped everything outdoorsy and I’ve missed the bush a great deal. It is with that in mind that I approached the Routeburn in NZ recently. In some respects, I was overprepared to buggery; though it didn’t matter this time, a better first aid kit than the basic one I had would be a good idea. I used my travel pack, rather than a bushwalking specific pack: this meant that the load rested below my hips rather than above. Whereas the hips are supposed to support the bulk of the weight. The pack itself was mostly fine for a short trip, Routeburn was 3 days over 32km, but I would need something better designed for future tramps. As for the Routeburn itself, oh my. It was like I was being welcomed home. The bush embraced me and encouraged me to feel at peace. The bush in the Blue Mountains is a homely place too, and I’ve always felt at ease there. Whereas I found the Kanangra-Boyd National Park inhospitable, a place that seemed out to get you and indeed it got a good friend. Of course, no wilderness should ever be taken for granted; people can die anywhere. Near the end of the tramp, I gave thanks to the trees and the land for welcoming me, and allowing me to feel at home. The tramp itself was not too hard, though it did push a little. I had two maps, compass and a whistle. Not needed really but good to have regardless. As someone commented, the track is like the 4 lane highway of bushwalking, and indeed it was. Packed with walkers and impossible to lose your way. The kiwis know how to construct a good track. Best bunkhouses I’ve ever encountered. It rained on the middle day, but I had wet weather gear and 2 sets of thermals (always a backup, just in case) so I was toasty. Still I powered through the exposed, alpine sections, as the forecast was for heavy rain and strong winds. The main section is supposed to take 4 hours and I did it in 2.5. Oops. 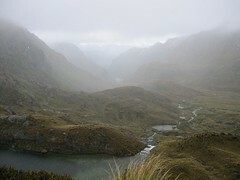 The forecast never eventuated and there was a misty drizzle all day so the views were often not as spectacular as they might have been. Yet that did not detract from the beauty of the walk; even in mist it was a magical place. It was so good to be in the bush again. That was my first trip outdoors in 3 years and I have missed it much. I like the NZ approach to their trails and plan to do many more of them. I feel at home there. 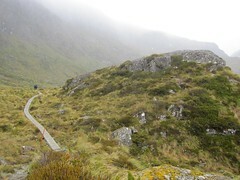 I’m now hoping to tramp the Kepler Track at the end of summer before it gets too cold. Ah … Now I understand your comments about getting your headspace back. Good on you. Glad the tramp was kind to you. We hope to do some of them once the kiddies are a bit older and more robust. Especially when it comes to walking!